There's a sense of deja vu about Toyota's form in the build-up to this year's Le Mans 24 Hours. OK, its manufacturer rivals have gone - replaced by some credible privateer opponents - but the manner in which it dominated qualifying makes it overwhelming favourite, regardless of its historic ill fortune in the endurance classic. Whether Toyota can finally overcome its Le Mans curse and win the race for the first time has been a popular topic this week but, like it or not, one of the Japanese manufacturer's six drivers is likely to steal the attention from his World Endurance Championship employer should he form part of the winning crew. Fernando Alonso hasn't set the headline pace in the #8 Toyota that will start the race from pole, but assessing how he has performed in his handful of on-track appearances this week has still been an intriguing process. But although Alonso will garner plenty of attention over the next two days, there are still sufficient other points of interest to keep track of during the race. The final qualifying session for the Le Mans 24 Hours was a damp squib as rain peppered the Circuit de la Sarthe. Few things were learned with four cars circulating through the darkness in the final 30 minutes of qualifying. But for two-time Formula 1 champion Fernando Alonso, it was yet another demonstration of his insatiable appetite to absorb every aspect of Le Mans. He ran slick, intermediate and wet tyres in the changeable conditions of Thursday night, getting to grips with every element he could face during the race. It's an Alonso characteristic we've seen before. In F1 pre-season testing, he was the only driver to set a time on the worst snow and rain-afflicted day, and Alonso's fastidious preparations for the 2017 Indianapolis 500 were well recorded. 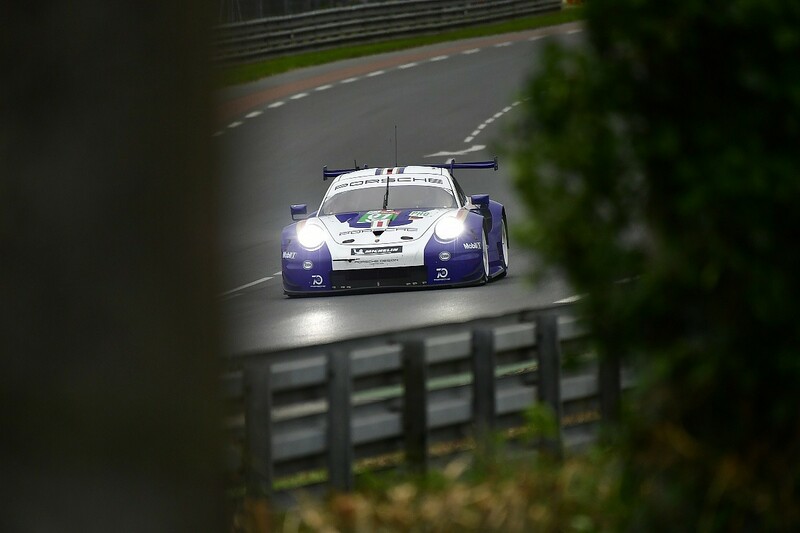 He also rapidly improved his one-lap pace during Le Mans qualifying and completed the third-most laps (48) by a Toyota driver over the three sessions. 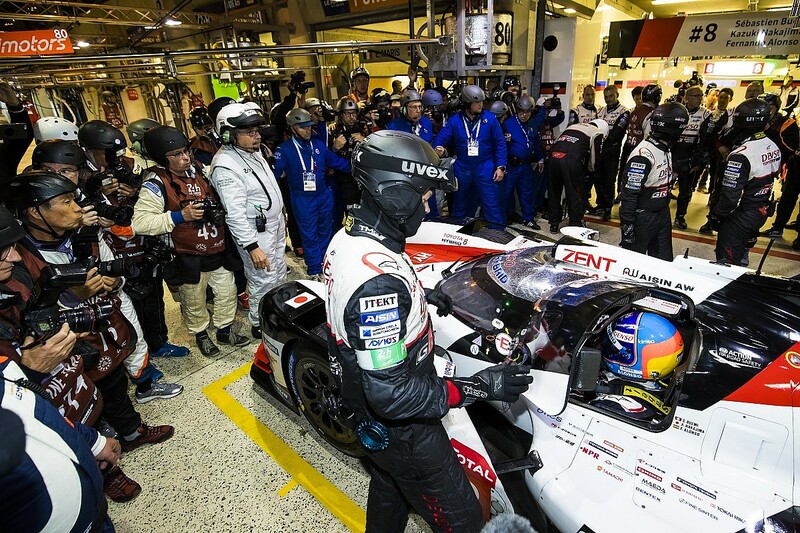 Having been the 12th quickest LMP1 driver in the first with a 3m20.991s lap, Alonso found an improvement of 2.97 seconds on his first flying lap of second qualifying - no mean feat when he was restricted to just two quick laps due to a catalogue of LMP2 and GTE shunts. That left Alonso's 3m18.021s leading time as the second-best set in the #8 Toyota and the third-best across the two cars overall, behind Kazuki Nakajima's stunning 3m15.377s pole lap and Kamui Kobayashi's 3m17.377s best. Alonso looks particularly at ease in sector two's combination of heavy-braking zones on the Mulsanne straight and the quick-fire turns of Indianapolis and Arnage. Traffic management is also increasingly natural to the Spaniard. 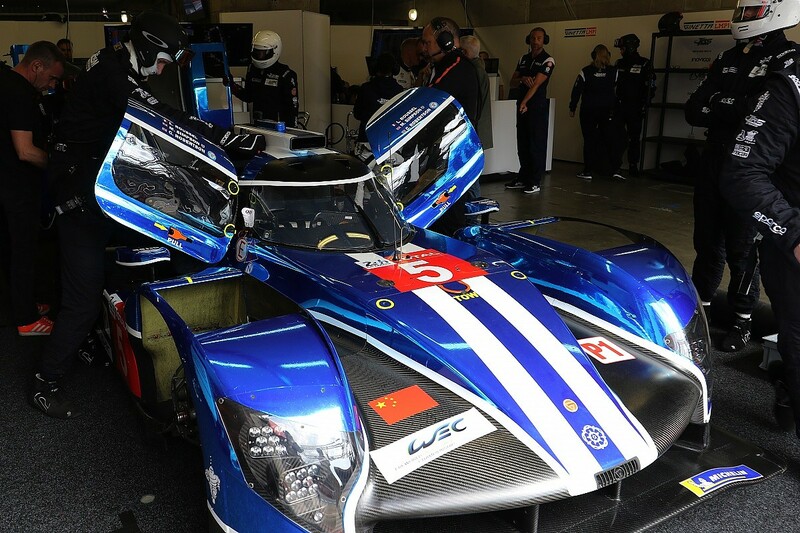 SMP Racing is nip and tuck with Rebellion as they vie to be the best LMP1 privateer. It was pretty much honours even between the two teams after qualifying, but not because they ended up separated by just four hundredths in the times. The fastest lap from one of the Rebellion-Gibson R-13s was actually more than a second clear of the best from one of SMP's BR Engineering chassis, only for Thomas Laurent to lose his time for ignoring the scrutineering light at the start of the pitlane. But the scoreline between the two teams was really 1-1. Stephane Sarrazin was the fastest privateer in Wednesday qualifying with a 3m19.483s. Laurent and Bruno Senna went faster for Rebellion on Thursday, the Brazilian's 3m19.449s just putting him third after Laurent lost his 3m18.252s. Come Thursday and the faster track conditions, SMP was already preparing for the race. A lot of fresh parts went onto its AER-powered BR1s and there was never a push for a time in the cooler temperatures, though it did endure some technical glitches. "I think we're now in the same ballpark as Rebellion," says Gaetan Jego, technical director of the ART Grand Prix-run SMP squad. "We're learning all the time and it now looks very close between us." Four minutes. That's all the time that had elapsed in Wednesday's practice session before the #5 Manor-Ginetta stopped on track. A software configuration issue was far from an auspicious start for the team, which had prioritised reliability over performance and predicted a "painful" qualifying. Mike Simpson's 3m25.203s lap with an hour remaining was credible, and more than two seconds faster than the car had managed at the test day, but the sister #6 car completed just seven laps and was consigned to the garage at the end of the session as Manor elected to change its engine. That pain was already creeping in before qualifying had begun. Come the end of the three sessions, things looked a little brighter. The #6 ended up ninth, 1.2s off the ByKolles, and had Leo Roussel's early times in the #5 not been removed in Q3 both cars would at least have cleared the LMP2 runners. Oliver Rowland's third-fastest time through the Ford chicane 'mini sector', one tenth off the Toyotas, proved the car has some agility, but that comes with the caveat that the Ginettas are running in higher-downforce trim. That in turn has hampered straightline speed, and Simpson and Rowland ended up 29th and 30th in the charts - the latter's speed being matched by the GTE Pro-leading #91 Porsche. Yes, the Ginetta is just about on the tail of its privateer LMP1 rivals, and the cars were eventually able to rack up 87 qualifying laps. But those fits and starts offer little indication about the car's reliability and its ability to sustain its pace during a stint. While we've learned about how and why Manor-Ginetta is playing catch-up, there's still plenty to understand about its ultimate performance level. Wind the clock back 12 months, and any suggestion that IDEC Sport would be on (class) pole at Le Mans would have been met with a scoff. 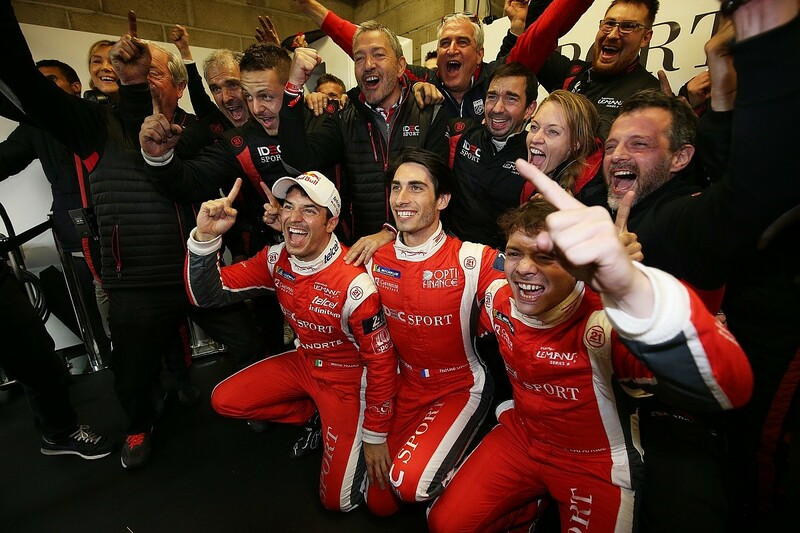 It's been quite the turnaround for the 12th best team in last year's European Le Mans Series to become a credible victory contender in a class of 20 prototypes, and its LMP2 pole owes as much to the shrewd addition of former Peugeot ace Nicolas Minassian as sporting director as it does to team patron Patrice Lafargue stepping back from the driving seat. Minassian won the ELMS title in a management role last year with Dragonspeed, where he admits he learned a lot from team owner Elton Julian, but wanted a new challenge - making Lafargue's offer an intriguing one. Determined to make IDEC more professional and, in his words, "more international", Minassian set about reorganising and appointed veteran engineer Dave Benbow, whose list of honours includes victories at Le Mans with TWR in 1990 and the '92 Indy 500 with Al Unser Jr, to lead its engineering efforts. "I have pushed a lot with this team to change it and make it more what I know from my experience, and they have let me do it - that's important," says Minassian. "If somebody doesn't let you do that, there is no point, so they have hired me to do this and it's working." With Lafargue's son Paul - a handy Silver-rated driver - joined in the cockpit by two ELMS champions in Paul-Loup Chatin and Memo Rojas, who followed Minassian from Dragonspeed, IDEC has an unflashy but consistent driver line-up that can go the distance, with an ELMS pole at Paul Ricard and a podium at Monza already this season to prove its form is no flash in the pan. 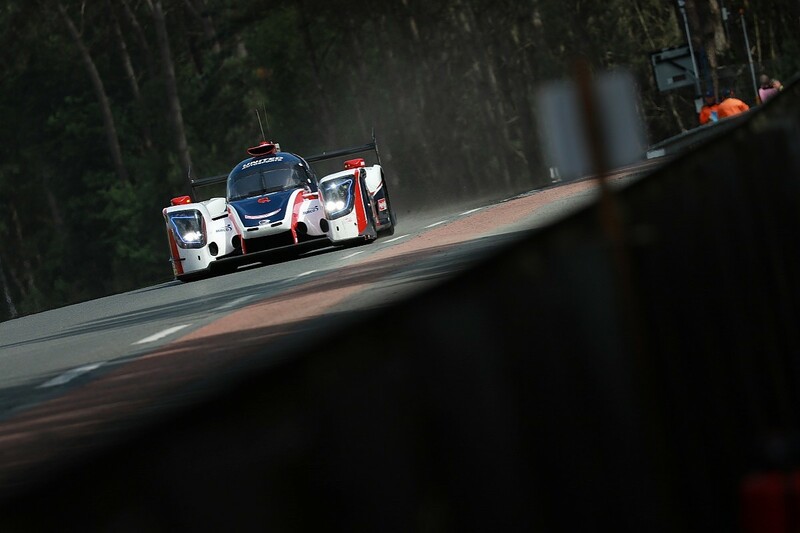 Few will have noticed it, but Hugo de Sadeleer's #32 United Autosports Ligier was clocked at 336km/h (208.7mph) on the Mulsanne in free practice. That's only 1km/h off the top speed achieved by an ORECA in the entirety of last year's event and 7.2km/h quicker than a Ligier had achieved at the same point in the weekend. The reality, however, is even better - those who used Ligier's low-aero Le Mans kit in 2017 found that the greater straightline speed brought with it a severe tyre drop off that made it impossible to triple-stint, so most went without it and were sitting ducks on the straights. "Last year it was 'pass me right or left, I will not bother to close [the door] because you are faster', I could only pass the GTs," says Filipe Albuquerque, who qualified the #22 United Autosports car in eighth on Wednesday. "This year it was interesting that the same ORECA didn't have the tools to pass us on the straight - that's very encouraging for the race." Ligier's improvement was brought into sharper focus in qualifying, as Will Stevens' lap of 3m25.376s for Panis-Barthez Competition was just 0.024s off last year's pole time. Stevens had suffered a puncture on his new tyre run in Q1 that left him an unrepresentative 12th, but last year's GTE Am winner admitted he surprised himself in Q3 by going fifth, a little over half a second behind the pole-sitting IDEC car. Given the best Ligier could manage last year was a 3m29.51s, the ACO's decision to allow constructors Onroak to make alterations to its Le Mans aero package appears to have been vindicated. For all the optimism in the Ligier camp, it hasn't changed the fact that ORECA has been fastest in every session so far and will still go into the race as hot favourite. In a moment of reflection after struggling with his "very complicated" Dallara, Giedo van der Garde was in no doubt about the car to watch at the head of the field. After all, it had put a clear half second on the rest in practice. "From last year to this year we've made quite a good step, but we are not as quick yet as the ORECAs," said the Dutchman. "The pacesetter at Spa was the #26 [G-Drive] car, the pacesetter in Monza [ELMS] was the #26 car and at the test last week the #26 car was again quick with [Jean-Eric] Vergne in it." 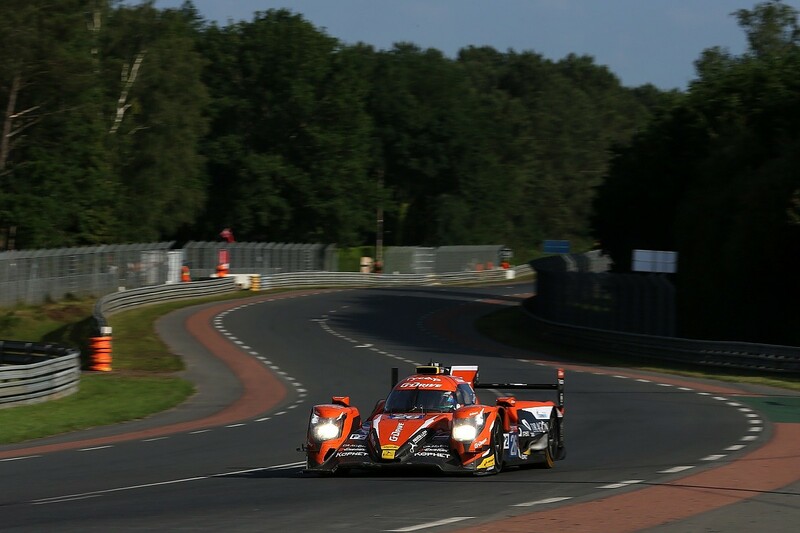 Yet there's a sneaking suspicion that we have yet to see the best from the TDS-run G-Drive car that so comprehensively dominated the WEC LMP2 class at Spa and led home a team one-two in the ELMS at Monza. Vergne told Autosport that he wasn't especially fussed about securing pole - a line echoed by team-mate Roman Rusinov - which may only seem sensible ahead of a 24-hour race, but also tells of a team oozing confidence. 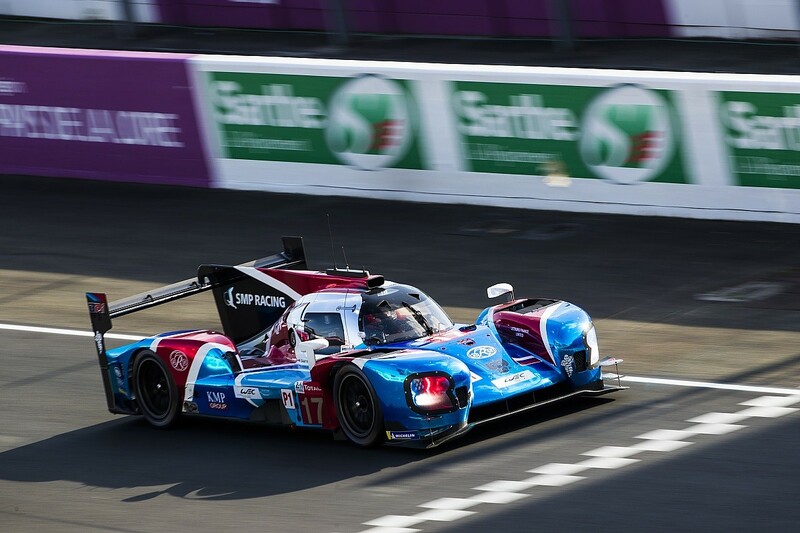 The second TDS car had been set for the top spot until Loic Duval's best time was deleted for failing to stop at the scrutineering light, but Xavier Combet's team still locked out the second row. "Right now you'd probably have to say it's going to be an ORECA," admits United Autosports boss Richard Dean. "If you were a betting man - if Paddy Power were here - the ORECA would be the short odds." 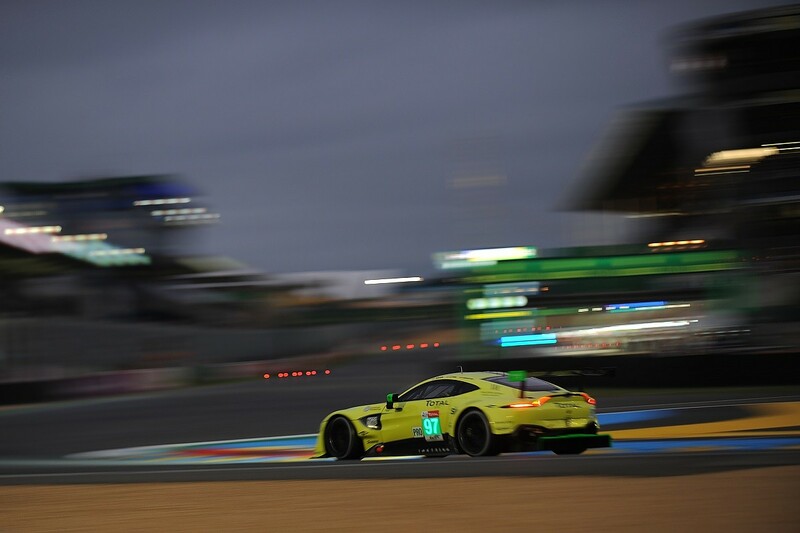 One of the biggest surprises in the GTE Pro battle has been how far off the pace defending class winner Aston Martin has been with its new Vantage. The British marque admits it didn't expect to be setting the pace, but it did think it would be "in the mix" with the other manufacturers. Instead, both its cars lagged - by five seconds or more - off the pace in qualifying and were down with the GTE Am runners. A look at the speed traps shows the problem clearly: the gap between the lead Vantage and the Ford GT is about 6mph, costing it up to two seconds in the second sector alone. "If you look at the detail, our car was fastest in the Porsche Curves," says AMR managing director John Gaw. "We went purple with Nicki [Thiim] in the car last night. "We know how slow we are in a straight line, but we also know it's the first year of running the car at Le Mans. If we came back next year, I'm sure we would be quicker. "We didn't expect to have the fastest car, but we expected to be in the mix." How much help the organisers are inclined to give Aston, we'll find out later on Friday, but it would have to be a fairly seismic adjustment to get the Vantages back in the game. Porsche may have pulled out of the LMP1 class for this year's Le Mans, but it's still going out all-guns-blazing to win in GTE Pro with its squadron of four mid-engined 911 RSRs. The retro-liveried Manthey WEC cars claimed first and second on the grid - although Porsche admitted that Gimmi Bruni's 3m47s lap in first qualifying was a little "lucky", given how much slipstream the Italian ace had. CORE Autosport's pair of IMSA cars are not far behind either, lining up in sixth and eighth places. The consensus among its competitors is that Porsche is the team to beat, but that isn't to say that the rest are ready to throw in the towel just yet. "Porsche are in a strong position," admits Corvette driver Oliver Gavin. "But in 2015 we came into the race with one car, started at the back, came through and won. You only need one bullet in the gun. That's what we are aiming for." Porsche itself isn't dismissing its opposition either, especially with Ford and Ferrari both securing second-row starting spots in the class. Defending outright winner Earl Bamber said: "If you look on the pure timesheets they say Ford and Porsche [are fastest], but when you start to look into the details with the fuel loads and what tyres people were on, there's a lot of people very close. "I would say it's not so clear cut. Corvette looks strong, Ferrari will be there." Tom Errington is Autosport's American Racing reporter, after moving across from sister company Motorsport Stats at the beginning of 2018. Having lived in South Carolina for almost three years, it's not surprising he has ended up covering NASCAR and IndyCar after returning to England and studying sports journalism at Huddersfield University. Tom has also covered international events for Autosport, including the Le Mans 24 Hours, the DTM, the Blancpain GT Series and the European Formula 3 Championship. Away from motor racing, Tom mostly despairs at the current state of Newcastle United, but also finds time for the latest cinema blockbusters and video games. James Newbold is the editor of Autosport's Performance and Engineering supplements. After completing his Politics and International Relations degree at the University of East Anglia in 2015, in a sign of things to come, he left his graduation ceremony early to cover the Spa 24 Hours. He joined the Autosport staff in 2018 after a period as a freelancer, mostly covering sportscar racing for a range of online publications, and has a keen interest in uncovering the stories behind unsuccessful motorsport programmes. He counts an interview with Mario Andretti as his career highlight to date. Jack Cozens is Autosport.com's International Editor and unofficial Hungarian touring car driver expert. He joined Autosport's Academy programme in 2015, shortly before graduating from Bournemouth University, and became the first junior to attend a race meeting outside of Europe for the publication when he covered the World Touring Car Championship finale in Qatar that year. A stint of 10 months as part of the Autosport and Motorsport News National team followed, before he assumed his current role in June 2017. Outside of the motorsport world, Jack is the heir to Sevenoaks' bagel empire and a keen Sunday league footballer, whose anger (at himself) usually outstrips his talent.